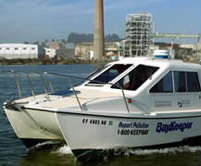 Donating your new or used car or boat to Baykeeper will be a contribution to protecting the San Francisco Bay while also providing a tax benefit to you. Proceeds from the sale of a donated vehicle are fully tax deductible for itemizing taxpayers. Baykeeper uses Vehicle Donation Processing Center, Inc., to accept vehicle and boat donations.To donate a vehicle or boat to Baykeeper, please go to: Baykeeper Vehicle and Boat Donation or call (877) 660-6689. Baykeeper is a charitable, non-profit 501(c)(3) organization. Tax deductibility information from the donation of a car or boat is provided by Vehicle Donation Processing Center.